If you’ve successfully completed Day 1, Day 2, Day 3, Day 4 and Day 5, then the sixth day is surely the best day of the diet and is also more rewarding. By now, you should see that your body is much lighter than before and you’ll also feel that your body is fresh, all thanks to the first 3 days of detoxification and cleansing. The Day 6 of GM diet is considered as a feast day as you can eat beef (or alternatives said in Day 5) along with a wide variety of vegetables you want. You’ll already see a lot of changes in your body and many followers of 7 day GM diet are expected to lose as much as 10 lbs or 4 kgs. Not only that, because of the fruit+vegetable consumption, you’ll see a different glow in your skin today. How to Prepare Yourself for GM Diet Day 6? As your body is already in an auto-mode of losing the extra fat through increased metabolic processes, all you need to give your body is some protein and fiber. You can get the protein from beef while fiber can be achieved eating vegetables. Apart from this you should also push your body to pursue lively activities or exercises, as this is the exact point where you need to test whether the diet has made any improvements to your immune system or not. Breakfast: Start with a bowl of mixed vegetables or vegetable soup with beef cutlets. Vegetables will give you a lot of fiber while beef will give you proteins. Lunch: You can choose any Asian food at this period which is because most of the Asian food is made with vegetable and beef. But remember not to include potatoes or bread. 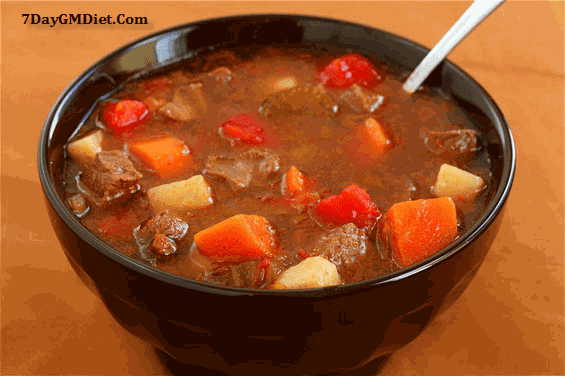 Dinner: If you feel tiresome, you can have a vegetable soup and a tasty hamburger made with beef or chicken. Snacks & Beverages: You can continue to eat meat and vegetable even during the snack period. However, it is advised to eat greens for mid morning snacks and beef during afternoon snack time. The reason here is simple – your appetite should be at normal levels so that it wouldn’t crave for other foods. Apart from these Water is your best friend. Coconut water may also be taken during midnoon but it may spoil your appetite by dinner. Slice all the mentioned vegetables into quarter inches and together with beef cubes (2 or 3 per stick), skew them on barbecue sticks. Baste them with butter and also season with salt and pepper as needed then grill on open fire until beef is tender and soft. It is for 3 servings. No juices or potatoes in your diet on Day 6. If you’re a vegetarian or don’t like Beef, you can substitute it with other items such as chicken, roasted turkey, Paneer (Indian cheese). Drink enough water (10-14 glasses). Like I said in the previous day’s menu for vegetarians, you can make a brown rice pulao with sprouts and instead tomatoes, add your favorite vegetables since tomatoes are not allowed on this day. Those who don’t like brown rice can replace it with regular white rice, but should add Cottage cheese (Indian paneer) along with sprouts and veggies while preparing the pulao. This pulao can be had for breakfast, lunch and dinner. During the morning and evening snacks time, you can drink the cabbage soup. Once you’ve successfully completed the Day 6 of GM Diet, you can then move to GM Diet Day 7 where you’ll be having a surprise.